Background: Expansin has wall-loosening function that is present in all plant species. Genome sequencing showed that the poplar (Populus trichocarpa) genome contains 36 expansin genes belonging to four subfamilies. Objective: The present report here supposes to dissect the codon usage pattern of poplar expansin genes so as to help us understanding their expression model in poplar and heterologous plants, and gave the suggestion of their appropriate use in future molecular breeding. Method: CodonW was used for poplar expansin gene analysis of base and amino acid composition, the second and third base arrangement of codons, and codon usage frequency of each poplar expansin gene. 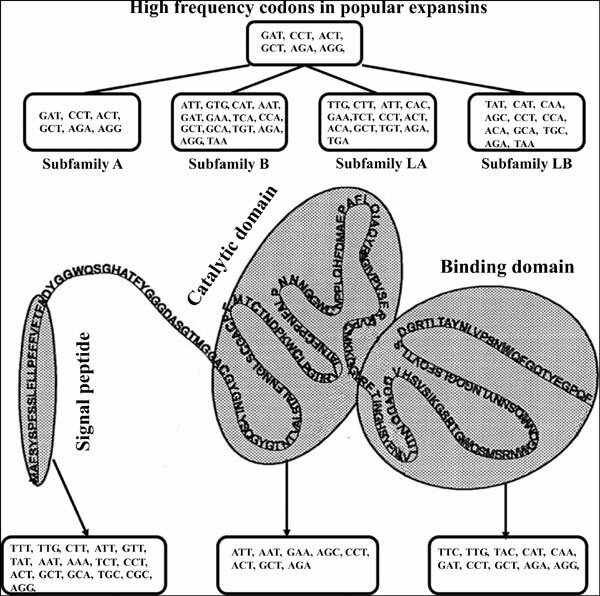 Further statistical analysis on optimal codons and high-frequency codons were conducted for each subfamily and each domain of expansin. Results: The poplar expansin genes have a low GC and GC3 content, high effective number of codons value (> 50), and few high-frequency codons (6 only). Statistical analysis revealed that each expansin subfamily and each domain has own characteristics in terms of amino acid composition, high-frequency codon distribution, and codon base combination. Especially, the subfamily A, B, LA, and LB contained 6, 14, 13, and 11 high-frequency codons, while the signal peptide, catalytic domain, and binding domain contained 16, 8, and 10 high-frequency codons respectively. Conclusion: The poplar expansin genes have low codon usage bias. Each subfamily and each domain of poplar expansin also displayed the codon feature characteristically. Populus trichocarpa, expansin, ENC, RSCU, codon.